Want to skip to the results? View the Hire Higher website HERE. Hire Higher is on a mission to educate the British youth. For students currently in education, there are limited options by way of information around ‘what’s next?’ after finishing schooling. After years of seeing first hand, just how unprepared a large percentage of today’s youth was when leaving school, Hire Higher founder Adelle took it upon herself to drive change in an old fashioned area of education. 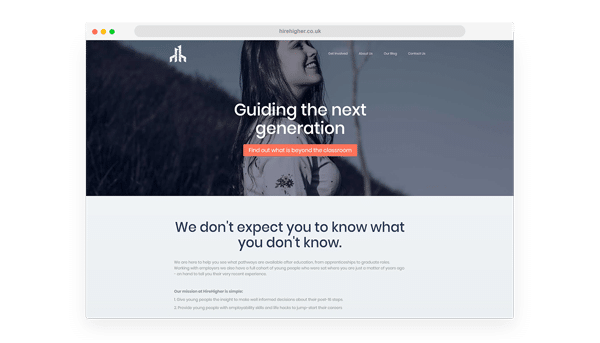 As this was a new project, Hire Higher required a brand new website, one that represents their brand to the fullest whilst being as useful and digestible as possible for their audience. Our approach to the website was to think differently to most educational sites. Avoiding the standard boxed layouts that are generally used, we opted for a floating navigation, large banner images and strong titles to grab the reader’s attention and provide information that can be digested at a glance. We also strayed away from traditional classroom photos, badge logos and light colours. Instead we focused on bringing a deep blue theme with clear oranges for calls-to-actions to guide the users to their destination. The use of more grown up photography helps paint the picture that this business is not focusing on their current schooling, but looking towards their future, who they aspire to be. Since the launch, Hire Higher has been working with a number of schools around the country, continuing to pursue their mission, all with their website as their main source of information. To view the Hire Higher website, just click HERE.